Purveyors of simplified and streamlined custom motorcycle products. Our philosophy continues: Keep It Simple. All products SIMPLIFY the process for the pro builder and enthusiasts alike. WE PROVIDE SIMPLE SOLUTIONS to COMMON PROBLEMS! CCCS is proud to introduce the world’s only internal motorcycle air ride suspension, SAS: Simplified Air Suspension. Soft tail air suspensions used to be a nightmare until now. The SAS has no compressor to mount, no hoses to run, no fittings to fail. Easy to install, raise and lower your rear end at the touch of a button. 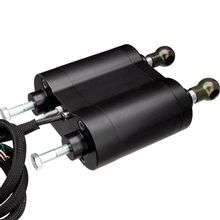 The worlds only internal Compressor Air Ride Suspension for softails! 30-Day Money Back Guarantee, 5-Year Warranty. Lifetime Warranty on Machined Parts! Free Ground Shipping on any SAS product in the US. CCCS is proud to introduce their newly engineered "Climax Hand Controls" package. Now for the first time, you can solve the "clean handlebar” dilemma with one complete package. You supply the bars...or choose from 4 "standard bar" styles...we supply the rest. Climax Hidden Hand Control Systems produces by far the cleanest looking "self-contained" handlebar systems available. Designed to function as good as they look, these concealed handlebar systems will enhance the look of any bike, whether H/D, Metric, or Custom. Want your bike featured on our website?